It’s funny. I have several pages of scribbled recipes/ideas and a folder full of recipes that I want to whip up. I could go many months before I would need to think about what to make next. But you wanna know how often I turn to this list or open the folder? Rarely. Instead, I find myself in the kitchen, making a dish that randomly pops in my head or making something that I am craving – chocolate is generally involved. And sometimes, I just need to use an ingredient before it expires or I am trying to clean out my fridge/cupboard. And that is how I came to make this banana bread. My freezer had become not a freezer but a holding pattern for overly ripe bananas. I have bananas stuck in every nook and cranny … I either need to eat my bananas faster or buy fewer. So, it was time to put some of these to use. 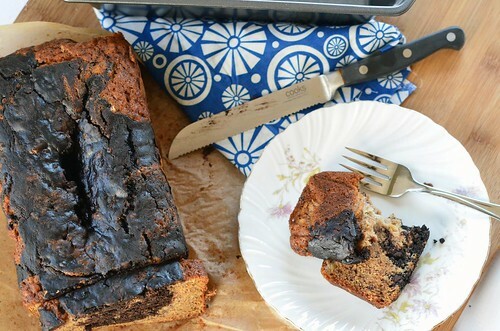 And the only thing I know how to make with overly ripe frozen bananas is … Banana Bread. But, guess what? 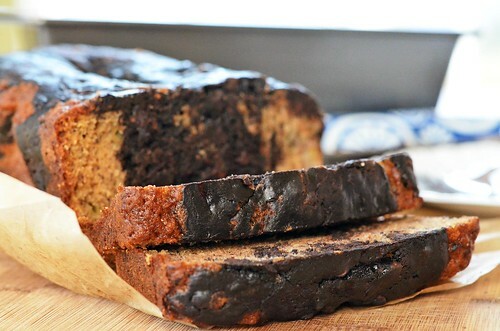 I am not a huge fan of banana bread – there was a year in college where we made banana bread until it came out our ears…and there my love for banana bread fizzled. Too much of a good thing. But, I figured it was time to dive back in and figure out a way to make it something that I would want to eat. 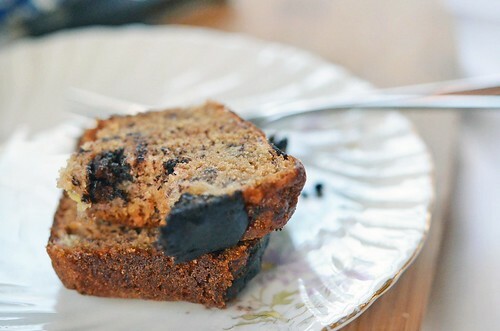 What came out of my kitchen I would not describe as traditional banana bread. 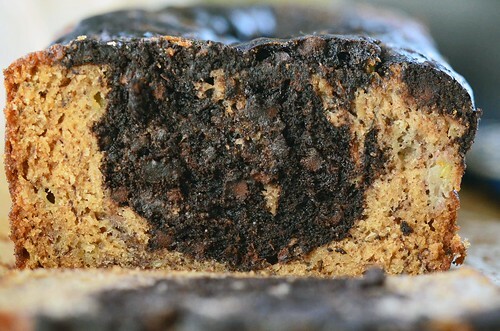 From the chocolate to the bourbon, this is banana bread on steroids. Most importantly though, I enjoyed it! No surprise right? Be a better swirler than me. Preheat oven to 350°F. Liberally butter the bottom and sides of a loaf pan (or line with parchment paper). In a medium bowl, sift together flour, baking soda, cinnamon, and salt. Set aside. In another bowl, whisk/beat together brown sugar, white sugar, and vegetable oil. Mix in mashed bananas, vanilla, and bourbon. Using a wooden spoon or spatula fold in the dry ingredients. Remove about 1/3 of mixture and set aside. Pour the remaining batter into prepared loaf pan. In a small bowl, whisk together the boiling water and cocoa powder until smooth. Mix cocoa mixture and chocolate chips into the reserved batter. Spoon the chocolate mixture onto the top of the batter already in the pan. Drag a butter knife through the batter in a swirling motion and remember to bring batter from the top to the bottom. Do not over mix when doing this. Place in preheated oven and bake for 40 to 50 minutes or until a toothpick comes out clean – kinda clean, there will be melted chocolate, but not batter. Remove from oven and place on wire rack for 5 minutes to cool. Remove from pan and let sit on wire rack until completely cool. Bread can be stored at room temperature if wrapped in tinfoil/plastic wrap for up to 3 days. It can also be frozen.